I’ve recently found myself in a position of being an apologist more and more often for Amazon and being criticized for it in some quarters. Don Linn’s weekend post Summer Breeze carries, not surprisingly, the fresh air of his steadfast resistance to irrationally exuberant Amazon-bashing. Those of you who’ve read this blog for a while know I’m a huge fan of indie bookstores but also have seen some huge benefits to readers of having Amazon in the marketplace, despite their sometimes bullying and hamhanded tactics. What bothers me most is a sort of irrational hatred (yep, that’s the word I mean to use) of all things Amazon by some. And I’m glad to see him speak directly about a fellow whose bellicosity suggests that he lost a leg to Jeff-Bezos. My good friend, Dennis Johnson at Melville House, continues to rail against [Amazon] while selling big numbers of Melville House’s (terrific) books to them. Johnson’s latest post on the subject of the Seattle white hump is a three-part Q&A with Mark Suchomel of the Independent Publishers Group. It was Michael Cader who reported the end of the standoff between Amazon and IPG — one of those quietly released bits of news floated late Friday as the holiday weekend was getting underway. What I will say is that I think we did our job well. And I should add that our sales are up 26% YTD, so it obviously didn’t hurt IPG a great deal in the short term. And every conversation about the DOJ/Agency lawsuit seems to devolve to, “But Amazon…,” despite, as nearly as I can tell, Amazon’s not being named as a defendant in any DOJ action. Look, they’re here. They’re big and bad. Your customers love them. That Amazon is a force to be reckoned with (and not just in publishing) does not give publishers the “right” to collude to improve their lot. The agency business model may make good sense, but if publishers broke the law while putting it into place, they still broke the law. Brian O’Leary, whose daily post is always worth checking, in Conspiracy Theory says what’s on the minds of many as we all watch the playout of the Justice Department action. Clearly, the publisher-defendants feel differently. And Laura Hazard Owen at paidContent has just covered the filings of Penguin and Macmillan — the two accused houses that elected to try to fight the allegations. Her report is headlined Penguin, Macmillan respond to DOJ in e-book price fixing suit. In parsing the filings (and linking to PDFs of the full documents), Owen picks up on high points from both companies’ positions, which of course are centered on their adamant denials of wrongdoing. As expected, the companies say their conversations were about aNobii and Bookish, not collusion. B&N CEO William Lynch needs to focus on answering this one important question: Why would someone want to buy a Nook over a Kindle? If their answer is “because we have GlowLight” he might as well just fold up his tent and go home now. Joe Wikert of O’Reilly Media doesn’t go so far as to tell Amazon that all is forgiven. But it may be safe to say that a Kindle starts to look better in the GlowLight of his new Nook. Highlighting some text in an ebook should be as simple as touching the screen at the start of the highlight and dragging to the end of it. That’s exactly how it works on the Kindle Touch, for example. Good luck trying to highlight text on the Nook. Your Kindle has its own email address so you can quickly send files to it without physically connecting it to a computer. Then there’s the handy Send to Kindle app, another nifty wireless way to move content. B&N doesn’t offer either of these two options so you’re stuck grabbing the USB cable and dragging files the old fashioned way. The Kindle app loads much faster…In fact, all the typical operations in the Nook app take longer than they do in the Kindle one (e.g., going to the bookstore, doing a search, etc.) The Kindle app feels much more polished and optimized than the Nook one. I’ve had two separate situations where there was no sample material for the Nook edition but Amazon offered a sample for the Kindle version. That should never happen. As Wikert points out, B&N Desperately Needs To Become a Technology Company. It’s not encouraging to learn that there are such big functionality and sales-convenience gaps between B&N’s signature ereader and its big competition. B&N needs to consider the entire ecosystem they’re operating in and develop a vision for what it could look like in 2-3 years. One has to assume that’s Redmond’s cue. Some have suggested that Microsoft’s investment in B&N will help them make the transition to becoming a technology company. If spinning off the Nook business is what it takes for B&N to start thinking more like Apple, Google and Amazon then let’s hope they do it soon. Self-publishing authors are as welcome as traditionally published ones at Bublish. I made a point to establish that with Kathy Meis, whose Serendipite Studios in Charleston is producing this new discoverability platform meant to “bubble up” books that authors would like to introduce to readers. *More on Publishers Launch is below — a live tweet-storm is planned. While your own exploration of the Bublish platform will, of course, be the best way for you to get a sense for its offerings, the basic element is the creation of a “book bubble” by an author, after uploading his or her book to the site. The bubble — sharable via social media — contains an excerpt of the book, some explanatory “insight” copy from the author about it, images of the author and the book cover, an author’s bio, and book synopsis. A free version of the program will allow an author up to three book bubbles (displays for three books, in other words), while a premium edition eventually is expected to offer some metrics and other features. This page from Bublish shows a “book bubble” for author Harrison Solow’s “Felicity & Barbara Pym. It features a book excerpt, an “author insight,” a synopsis, an author bio and website link, plus images of Solow and her book cover. Throughout the system, authors and readers’ declarations of interests (genre, etc.) will help the program match books of interest to readers who register. And initially, of course, Meis is going to need authors to sign up and create book bubbles so there’s something there to be discovered by readers. She’s outspoken, by the way, in her appreciation for the boost the Bublish venture got from its exposure at O’Reilly Media’s Tools of Change conference this winter, in the Publishing Startup Showcase. She taped a short chat there. Could I be happier with the name of this new effort in discoverability? Regular Ethernauts know how I feel about corporate-cute names. Take Pinterest. Please. And I’d like to have kicked the Twitter founders’ four butts in time to save my own favorite social medium from terminology that’s for the birds. But even if it sounds as if the Lawrence Welk show is on the road again, Bublish’s Meis is completely serious when she talks of “bublishing” — she uses it as a verb, too. Deep breath of Ether. Open mind. Where is Norma Zimmer, the Champagne Lady, when we need her? This one is from Bookigee. Did I mention corporate-cute names yet? Where is Andrew Rhomberg of Jellybooks when we need him? Seriously, I regard Bookigee chief Kristen McLean very highly, having heard her speak at Book^2Camp this winter, seems like about 18 years ago. Where Bublish is focusing on discoverability and connection between authors and readers, WriterCube is being designed as a DIY tool in marketing and analytics for authors. Just going to an alpha test group today, Le Cube is to be demo-ed on June 7 at the BiSG Digital Show & Tell event at BEA. More information on the Cube-to-come is here, in a newsy update for those who have registered their interest. Not to be overlooked, Miral Sattar’s BiblioCrunch e-publishing platform is being launched at BEA — another one featured in TOC’s showcase earlier this year. Where were we on the cute-name issue? The idea is that authors and publishers can post jobs they need handled by professional publishing-services outfits, and El Crunch will then solicit bids from its pool of service providers for the work. 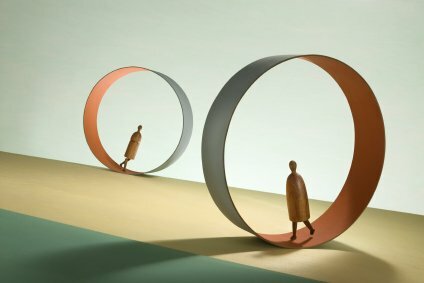 So, clearly, even though we’re up to our eyeballs in slightly fevered startups — they’ve all been on overdrive trying to get into shape to launch something, anything, in time for BEA — this one is fully as legitimate as WriterCube and Bublish among new offerings coming online, particularly for authors. Here’s where to see the site as it develops its battery of professionals and moves into launch. There may be a topic of interest to somebody somewhere that we won’t cover, but we’re definitely not missing much. Mike Shatzkin, writing about his and Michael Cader’s upcoming edition of Publishers Launch on Monday at BEA, demonstrates, if nothing else, the breadth of the digital strain under which publishing’s people are laboring as this year’s big trade show rolls around. I’ll be live-tweeting this daylong confab from the Javits Center: Watch hashtag @PubLaunch for the tweet-storm. When we debuted it at Digital Book World last January, we were pleased to recruit a consulting client of my Idea Logical Company, Linda Holliday of Semi-Linear, to moderate the sessions. On June 4, Linda’s own new product will be the kickoff Launchpad subject. And you thought we were through with startups for a little while, didn’t you? This one is Citia, and Holliday tells Lauren Goode at AllThingsD that her product can get you the gist of a nonfiction book in 30 to 90 minutes. Holliday says the software deconstructs and reconstructs the book you’re reading. For example, a 400-page book will be broken down and assembled into seven different topics. Each of the sections will include a short description about itself, and together they offer a more comprehensive summary of what the book is about. The Citia app is available only for iPad, and should be in the iTunes App Store Friday. The summaries are displayed in “3-D” cards across the interface of the app; since it’s digital, videos and voice-overs are also included in some of the works. A more familiar (new but not brand new) tool, Hugh McGuire’s Pressbooks, is on the list, as well, as is Ron Martinez’ Aerbook Maker. In fact, if you get anywhere near BEA this year without a startup to launch, you’re going to look a little silly. And just to Etherize this portion of the festivities far beyond what anyone needs or wants, I’ll just point out that neither Citia, Pressbooks, nor Aerbook is a corporate-cute name. Perfectly legal! And when you avoid the cuteness, you help publishing-in-extremis look a little less like something ready to be wrapped in kitty-cat shower curtains and tossed into the trash. Laura Hazard Owen, czarina of paidContent, is also on-hand at Publisthers Launch, to moderate a panel of agents featuring Laura Dail, Tim Knowlton, Simon Lipskar, and Jennifer Weltz. Also on the bill are Kelly Gallagher of Bowker and more, all previewed for you by Shatzkin in Publishers Launch conference at BEA will cover a wide range of digital change issues. Live tweets should begin that morning from the Javits at roughly 8:45a ET. Join us. That’s Stina Lindenblatt at the QueryTracker.net blog, in Making the Most of Writers’ Workshops. In the course of putting together a useful guide to sorting out workshops available (’tis the season), she gets at one of the more vexing elements of choosing your best shot: the leadership factor. I was recently in a course in which the instructor constantly promised to post the latest lecture or provide feedback on assignments, but more often than not, it didn’t happen. Her feedback was brilliant, when she bothered to give it. Turns out, the instructor was notorious for not living up to her promises. Buyer beware. And if you run into a problem somewhere, help others avoid the same mistake with some honest, not vindictive, feedback. And in terms of larger events — conferences of various types — Writer’s Digest’s Chuck Sambuchino offers What Are the Best Writers’ Conferences To Attend? at Writer Unboxed. Perhaps if you want to just sit down and write — maybe finally start that novel — then an intensive retreat is just what you need. If you’re not sure what you need (perhaps you’re creating a lot of different stories and writing projects), then a general conference sounds like a good bet. My best guess is that there are approximately 200 writing conferences a year in the United States alone. That’s a lot of options — so take your time, do some research, and see what a conference has to offer. There is a way to stay focused and engaged throughout a long-arc project, and to be less prone to the assassins of creativity. In short, we need to flip this beginning/ending advice on its head, and end with the beginning in mind. Todd Henry wants you to trade coming for going, and End With the Beginning in Mind. It’s a technique for taking a break or knocking off entirely for the day with a good idea of what you’re going to do as soon as you pick up a project next. 1. Before you close out your work for the day, capture any open questions that you are currently working on. If you were to continue working right now, what would be the very next thing you would do? 2. Write those questions and the next thing you would do on a post-it, or a sheet of paper, and leave it where you’ll see it the next day. 3. Determine right then what you’ll do first when you next sit down at your workstation. Establish a starting point for your work. This will give you immediate traction. Having something to do prevents the paralysis that accompanies needing to decide what to do. The only way to do your best work is to actually be working. Can you name one thing that could harm your writing if you do it—and if you don’t? Writing “routines” might not be the first answer to pop to mind. But nothing affects our writing more than the routine (or lack of one) with which we implement our writing into our day. K.M. Weiland’s cautionary post How Routines Save (and Ruin) Your Writing gets you somewhere between “lack of productivity and discipline” and “lack of flexibility” in a search for that proverbial happy medium. Unfortunately, if we don’t approach routines with just the right mindset, they can cause more harm than good. And you may hear echos of this theme in the third part of Jane Friedman’s fine triptych of essays on the city she soon leaves, Cincinnati, to begin work at Charlottesville’s Virginia Quarterly Review. I used to think routines would make me boring, predictable, and uncreative. Quite the contrary. If you’ve read any of Jonathan Fields’ Uncertainty, you realize that routine represents a certainty anchor—a stabilizing and trustworthy force that leaves you free to take risks elsewhere. 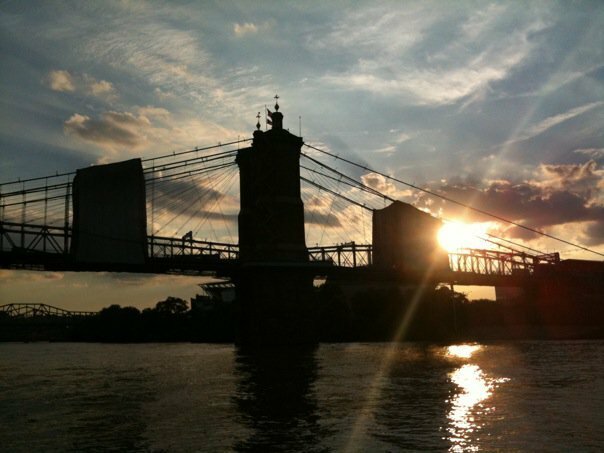 There are some rituals I always wanted to have in Cincinnati, but never managed to develop. I wanted to spend Saturday mornings at Findlay Market, but could never seem to get up early enough (or feel motivated enough to join the crowds). The last place I’ll be in Cincinnati, the Saturday morning I drive off, is Coffee Emporium. I’m already envisioning my last time through that door, wondering exactly what a good-bye looks like, and leaving with caffeine in hand, to find new rituals in Charlottesville. In any revolution, language matters. One powerful word in the digital revolution is “legacy”. There is a conscious attempt to employ the word pejoratively, to suggest that existing media businesses – publishers, in the case of books – are going to fail to make the leap to a new world. Stephen Page heads up the “legacy” publisher Faber and Faber in the UK. Stephen Page’s essay in The Guardian runs with this image (credited to Felix Mann and Kurt Hutton/Picture Post/Getty Images). 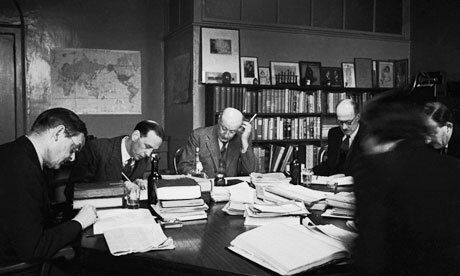 That’s a 1944 picture of the Faber and Faber board of directors at work. And having started this gassing of the Ether with slings and mostly arrows flying among self-publishing enthusiasts, it seems prudent to hear from anybody brave enough at this point to stand up — without a DoJ gun to his head — and speak up for what once was, and what won’t be again. Implicit, I suppose, in the pejorative use of the term legacy is that we at Faber, like other publishers, don’t get it – “it” being the new economy, the new rules. There is something in this, of course. It’s harder to transform an existing business into one with a new culture and cost structure than to start afresh. Page’s essay in The Guardian, has a bold headline: Publishers should be proud of their legacy. Legacy as inheritance, however, describes strength for publishers. In the new world this strength has new possibilities if handled well. Literature is instructive on this. In Bleak House, the Jarndyce inheritance is poison in the obsessive, greedy hands of Richard Carstone. In Great Expectations, Magwitch’s bequest to Pip is one of extraordinary generosity, which Pip struggles to live up to. I’m not, perhaps, as concerned at this precise point about whether you agree with Page, as I’m interested in whether you’ve noticed that he has just resorted to literature to make a point. And, of course, he selects well. In the arguments we’re all holding these days, we’re bashing around about who is “independent enough” to call herself “indie” — or whether we can yet say “self-publishing” without the echo bouncing back to us as “vanity.” When do you hear someone in those tiresome, often noisy and disjointed comment streams, pull out a literary reference? Many publishers’ legacies offer strength and opportunity, but these are benefits to be earned, not least through listening to writers and readers; they are not entitlements. He’s right. The DIY hordes somehow convinced by the Internet’s advent that they’re writers do seem to function on an assumption that they’re entitled to be the free-range successors to publishing coups of old. As if “throwing up a few ebooks on the Internet,” as author James Scott Bell so entertainingly likes to put it, is the logical action once you’ve crawled up and stood on the shoulders of Miller (Henry or Andrew). In my view, those who seek to convince consumers of the inevitable irrelevance of existing cultural and entertainment companies do so precisely because these companies have power and expertise. Not power to control distribution any more, but certainly the power to fight for the rights of creative people, to invest in them, and to think imaginatively about what might be made from excellent intellectual property. What happens when fury at gatekeepers becomes the sorry overreach of “screw them?” What of self-styled literary people who don’t know Faber from their iPhones? Our legacy at Faber is one of bringing books to readers and creating value for writers. Our legacy is in long-standing relationships with – and investment in – writers and their works, from TS Eliot to Seamus Heaney, William Golding to Barbara Kingsolver, Harold Pinter to Polly Stenham. Our legacy is the ownership of copyright licences (in both print and digital) from more than 80 years of publishing. When will the new DIY-ettes be able to claim such grace? Not soon, at least not many of them. Don’t get me wrong. Mistreatment of authors, taking advantage of your most indispensable creativity, paternal “don’t worry your pretty head” disdain — all that has occurred at times and is occurring in some instances, and it’s reprehensible. And I’m disgusted by excuses for market manipulation. If regulations have been transgressed, punishment is correct. As Don Linn has told us in this gassing, “But Amazon…” is no excuse. And as Brian O’Leary has told us, breaking the law is breaking the law. Given the choice of legacy or no legacy, I’ll take the legacy. Maybe we won’t. Maybe I won’t. Maybe you won’t take legacy. But what fools we are if we don’t remember to look for the better heads, the brighter intentions, the brilliant achievements that somehow have come from decades of a system we know was in many ways corrupt. Are we really so tricked up about these startups, startups, startups, tools, tools, tools … that we can’t recall what we once gathered to do? So, please, let’s stop regarding legacy as a handicap; let’s just talk about successful and useful businesses today, wherever they come from, be it the past or the present. You know what? I think we can give him that much. I think we owe ourselves, not Stephen Page, that much. Because we’re here to find the literature in our future. That’s what it’s about. That’s all it should be about. The DoJ and other entities will do the rest where needed. Let them go about their duties. We need to be about our own business. If not for Page, for ourselves. Literature to come. Thanks for the shout-out and for continuing the conversation! Just a head’s up: “The Man Who Thought He Was King” is actually the name of the Fantasy Faction article that starts this whole thing. Another excellent Ether post–I snagged quite a few great links to check into. Thanks as always for putting this all together. Very kind of you, @AngelaAckerman, thanks so much for reading AND commenting! Thanks, Porter. This sounds like a solid and reasonable plan for all writers-“double down on the work at hand” while waiting out the storm. Hey, @AnneRAllen, thanks and where did I refer to you wrongly? I can’t find it, searched the Writer Unboxed piece, etc. Will fix it if you show me where it is, please. Thanks! Thanks, @AnneRAllen:twitter , got your name fixed in the Writer Unboxed comment, and yes, I’m amazed at @Bitly:twitter as well — particularly in that they’ve rendered the toolbar short-function useless. They basically just kissed off their entire subscriber base. It’s really a ridiculous move. Thanks. (Although I think Anne R. Ross has a nice ring to it.) Glad you agree with me on bit.ly. It seems like a move out of a Dilbert cartoon. Thx for your honest description of the conference. I liked how you included so many points of view. I stumbled across the Kobo site a few days ago and found it intriguing, refreshing in its novel approach. Let’s give it a chance, guys. Don’t count it out before it’s really launched!